In 1857 a French bookseller named Edouard-Leon Scott de Martinville developed the first sound recording device, the "Phonautograph." It recorded sound waves on a paper cylinder covered with lampblack. The device worked fine except for one small flaw. There was no way to play back the recorded sounds. Well, now there is. A group called the First Sounds Initiative have recovered the sound from one of de Martinville's recordings made in 1860. Click here to listen to the song "Au Clair de la Lune" recorded 148 years ago. So the next time some audiophile starts going on about formats, just give a superior sniff and say "Vinyl? Well, if you must have the latest toys I suppose so. I'll stick with lampblack, thank you." DO NOT HESITATE. Control infested patches IMMEDIATELY. If you're bored with driving a plain vanilla automobile, even a hybrid, why not go for something more exotic? Try a Japanese illuminated truck, for instance. If that doesn't float your, um, boat, maybe you should get around in a giant mechanical squid or elephant. Because it's not where you go that matters, it's how you arrive. Face it, you don't hear as well as you used to. Remember that high pitched whine the TV set used to make? It hasn't gone away -- you're just not hearing it anymore. Age-related hearing loss, or presbycusis, is a fact of life: after age 18, the sensory cells inside the ear start to slowly die off. Each of these cells translates sound waves from the outside environment into electrical impulses that can be understood by the brain. But each cell doesn't react to every possible sound. Instead, they're specific -- each cell only reacts to a narrow band of pitches, determined by its position inside the inner ear. So when one of these receptor cells dies, the ear loses the ability to detect particular sounds. Typically, the high-pitched sounds go first. Maureen McHugh found a site that lets you test the inevitable deterioration of your ears for yourself. It lets you test ultrasonic tones (as a prelude to downloading ultrasonic ringtones, natch), ranging from 8 kHz to 22.4 kHz. Typically, only people younger than 20 can hear the tones above 17 kHz. When I tried it out, I could hear up to 15.8 kHz without any problems, but at 16.7 kHz I had to turn the volume all the way up to hear a faint high-pitched noise. The program declared that my hearing indicated that I was "in my 20's," so I started feeling a little smug. Hearing as good as someone 10 years younger than me! Take that, time and decrepitude! Then I made my daughter try it out. For her, the 16.7 kHz pitch that I could barely hear was an agonizing, annoying, loud whine. We kept raising the pitch. She heard them all until we got to the freakishly high 21.1 kHz pitch, which she described as "very soft and hard to hear." Ah, youth. Tomorrow, March 25, marks the anniversary of the discovery of Saturn's giant moon Titan in 1655. Titan was discovered by Christian Huygens, which of course is why the 2004 space probe to Titan was called the Huygens lander. Appropriately, the Cassini probe (which served as "mother ship" to the Huygens lander) is due to make a close approach to Titan tomorrow. Titan has been in the news lately because of indications that it may have a subsurface ocean. It seems like every two-bit celestial body has a subsurface ocean nowadays. By a happy coincidence, the Strange Maps Web log has a nice post about a recently-discovered methane lake on Titan. Presumably one can sit on the shore and listen to some rather chilly Sirens. Some parasites warrant international attention. Earlier this month, a report from the UN Food and Agriculture Organization announced that stem rust fungus had been identified in fields in Iran. Why the big deal about some smutty plants? Because they’re a strain of wheat that was supposed to be resistant to the fungus in the first place. Stem rust (Puccinia graminis) has been a pest ever since humans invented agriculture. 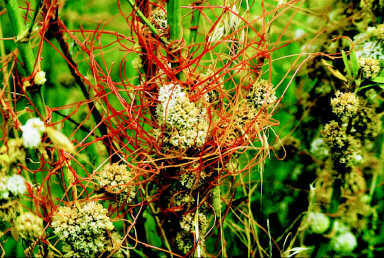 It parasitizes cells in the stems of grass crops like wheat or oats. Different strains of the fungus specialize on different host plants – a wheat stem rust won’t be caught dead on an oat stem, for example – but their lives all follow the same general, ugly pattern: fungal spore lands on plant, invades the cells in its stem, proliferates, and builds spores that eventually erupt outward in large red masses on the surface of the plant. Each mass releases more spores, which are carried off by the wind to find new plants to infect. The fungus is devastating enough to an individual plant. Now imagine what can happen when millions of identical plants are planted side by side. Historically, farmers feared rust because it could turn a promising crop into a field of broken and dying plants. Then came the Green Revolution of the 1950s, and new wheat strains bred (by Norman Borlaug himself!) to resist rust infections were planted around the world. Crop yields soared, and starvation was held at bay for millions and millions of people – a good thing, without doubt. But given enough time, natural selection has a way of messing these things up. Tangled Bank #101 is up at Tangled Up in Blue Guy. Lots to enjoy there -- check it out! Sir Arthur C. Clarke has died. He was 90 years old, and did more in that time than other people could accomplish in 900. For a good 20 years he was the public face of science fiction, with international fame beyond that of even Robert Heinlein. He also invented the communications satellite, was a pioneer SCUBA diver and underwater photographer, served in the RAF during World War II, lived for decades in Sri Lanka, taught, wrote, lectured, knew everyone worth knowing in half a dozen fields, and never stopped learning. Tonight, go out and look at the stars. The Giant Space Robot is nearly ready. Let's say that again, just to savor the sound. The Giant Space Robot is nearly ready! We didn't have Giant Space Robots when I was a kid back in the Second Millennium. Now we do. This Giant Space Robot is a construction tool, part of the Space Station's "Canadarm" manipulator. Essentially it's a collection of cameras and smaller arms to go on the end of the big main arm. For now. Presumably once the precocious child of the designer (and an adorable monkey!) takes up residence on the Station the Giant Space Robot will turn to battling orbital bad guys. I, for one, won't be surprised. There's an interesting post about 16th-century Japanese depictions of disease-causing organisms over at the Pink Tentacle Web log. They're basically hypothetical parasites responsible for various forms of ill health. The illustrations have an appealing Dr. Seuss quality, and one almost wonders if they're the result of some early-adopter Japanese physician getting his hands on a Dutch-made microscope and trying to fit what he saw into the traditional paradigm of Chinese medical theory. Several look like plausible parasites or microorganisms.